1906 saw the completion of one of the greatest feats of exploration in history, the crossing of the North West Passage by Roald Amundsen. The North West Passage was the great goal of polar exploration and had defeated explorers was centuries. Even the British navy, the most powerful naval force of the era failed. They would get so far, then get stuck in the ice. With luck they got out before their rations expired. Then the Master Explorer Amundsen came along. He spent time learning how to live of the land from the Eskimos. He knew the water could be shallow so only used a small 47 ton fishing boat. The crew totaled just seven. But he took dogs sleds, and rifles, when they got stuck in the ice they went hunting for caribou. Instead of starving they got fat. Because they had mobility they were able to locate the North magnetic pole. A major scientific achievement of the time. It took them three years but finally they reached the Pacific. 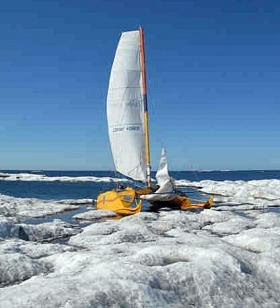 It took Sebastien Roubinet one year to build Babouche - a 7,5 m ice catamaran designed to sail on water and slide over ice. Sunday, the vessel made Sebastien's dream come true. The adventurer and his friends connected the Pacific to the Atlantic by the north of Canada; claiming the first Northwest Passage made without engine in one season. "Hundred years ago, Amundsen crossed the North-American archipelago from the East to the West and became thus the first person to carry out the passage of this way. Now, Sébastien will try become the first person to carry out this passage only by sail," read the expedition project description. Sunday - the triumphant dispatch: "GAMBLE WON, CHALLENGE SUCCEDED, DREAM REALIZED... for Babouche, Sebastien, Anne-Lise, Eric and Boris!!!! Babouche reached Greenland!" The passage took 3 months and 21 days, and spanned 4500 miles. As the ice melts (partially) only two months of the year, August and September, Babouche was in a hurry to get through. The crew took turns, with Seb and Boris nailing the long, final leg. The team lost the mast at one point, had no heat - and used only sun and wind power for progress.